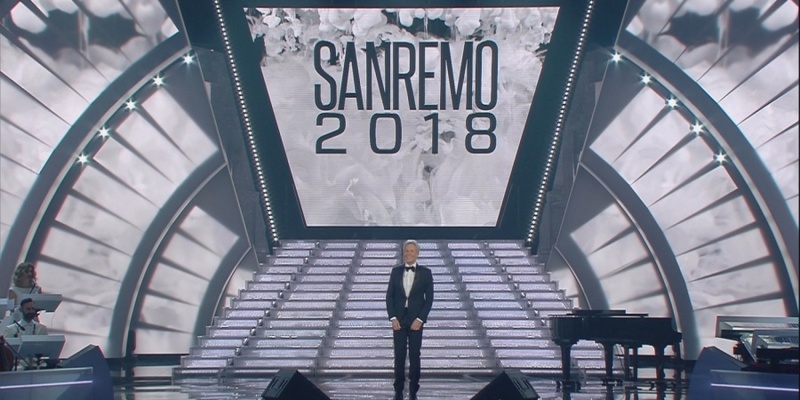 68° Festival della Canzone Italiana di Sanremo 2018 has started in Italy. In tonight's show we had all the 20 songs in the Campioni – Big Artists section presented. This evening's voting was a mix of 40% televote, 30% demoscopic jury, 30% press vote. BOOKMAKERS' PREDICTIONS:Odds: Who will win Sanremo 2018? Beside the 20 songs, we also had some guest stars appearing: Fiorello, Gianni Morandi, Gabriele Muccino and Tommaso Paradiso. Watch tonight's performances on YouTube and cast your vote in our poll. Annalisa – "Il mondo prima di te"
Lo Stato Sociale – "Una vita in vacanza"
Ermal Meta & Fabrizio Moro – "Non mi avete fatto niente"
Elio e le Storie Tese – "Arrivedorci"
Ornella Vanoni feat. Bungaro & Pacifico – "Imparare ad amarsi"
Red Canzian – "Ognuno ha il suo racconto"
Here is the schedule for Sanremo 2018 – for simplicity's sake, we will concentrate on the "Big Artist" category, as the winner of this category will be offered a ticket to Eurovision Song Contest 2018 as the Italian representative. The ranking for the 20 contestants will be calculated based on the whole week and revealed. The Top-3 advance to the Super-final. Top-3 will perform again in the Super-final. The winner of the Sanremo "Big Artists" category has the option to represent Italy at Eurovision Song Contest 2018 in Lisbon. If the winner declines to go to Lisbon then RAI will internally select another participant. This was the case in 2016, when Stadio won Sanremo 2016 with 43% of the votes in the Final. They couldn't compete in Eurovision 2016, so the runner-up Francesca Michielin was offered the ticket to Stockholm with her Sanremo entry "No degree of separation", finishing 16th at Eurovision 2016. Claudio Baglioni will host Sanremo 2018 along with various co-hosts. Baglioni is also the artistic director of the live shows.